Read our reviews - hands down, people find our home welcoming, comfortable, clean and well equipped with everything you need for a perfect getaway. Custom built hilltop home located on 5 private acres with expansive, beautiful views of Newfound Lake, Mt. Cardigan and more. House is ideally suited for up to 6 guests. As we are located in a private neighborhood and need to be respectful of our neighbors, we do not allow parties, events or motorcycles. We are dog-friendly. Swimming and boating in one of the country's cleanest lakes - Newfound Lake. Hike many of the nearby trails through the White Mountains and more. Central NH location for easy access to many of NH's best attractions: skiing, water sports, hiking, shopping. Quiet and solace of yesterday with all the modern conveniences of today. Shopping in Tax Free NH: No sales tax every day in NH. More savings by visiting Outlet shops in Tilton - 25 minutes away and new Premium Outlets in Manchester - 1 hr south or North Conway - 1.5 hours northeast. After a full day of shopping, relax in our fully equipped cabin with every modern convenience you need. Great spot for a girls weekend away. Dining Out: Lots of great local spots to eat from the fun of Irish entertainment at Kathleen's Cottage to fine dining with sunset views at The Inn at Newfound Lake. In-town pubs and casual spots for families for a complete vacation from the every day toil of meal-making. For those who want to dine in, house is fully equipped with all you need. Central to NH's Best Ski Spots: Just 15 minutes to Tenney Mountain and 30 minutes to family friendly Ragged and Gunstock. Come home for lunch and return for night skiing, tubing and sleigh rides. Less than an hour to Waterville, Loon and Bretton Woods makes for an easy day trip from our base in Bristol NH. Custom built in 2001 by owner. Careful attention to house layout and amenities. We found the land listing and couldn't believe our luck in finding the incredible view in a quiet neighborhood yet close enough to plenty of shopping, dining and recreational options. Private nighborhood association - many year-round residents make this a real neighborhood, not just a vacation destination for multiple renters. Views out to Cardigan Mountain and other area mountains for great hiking trails. Overlooking Newfound Lake, one of the cleanest lakes in the country. Quick drive down the hill to the Bristol town beach and short drive to Wellington State Park. Boating activities nearby. Expansive views out over the beauty of pristine, quiet Newfound Lake. Mt. Cardigan and more ring the horizon beyond Newfound for incredible fall foliage views. 4-zoned heating system on oil heat. High-speed WiFi connects throughout the house. Available for use upon review of instructions with owner prior to stay. Provide your own wood. Double set of china, glassware, mugs, serving dishes of all sizes. Beautiful round farmhouse table seats 8 comfortably. Lending library - adult and kids. Many family favorites - close to 100 titles. Many popular Disney movies, Harry Potter set. Private balcony with chairs off master bedroom. Screened porch for evening quiet time, overlooks private 5 acres of woods. Full length of house deck with incredible sunset views. Chairs and bistro table. Due to loft set-up and deck with drop-off, prefer to limit very young children from premises. Minimum age of 30 for responsible rental party. We do NOT rent out for events - parties, weddings, reunions, etc. Maximum occupancy at any time is 8. No last minute rentals. Bookings must be at least 10 days prior to check in date. Amazing house! Clean and has everything you need. The view is gorgeous. The view from this log home is spectacular! You will love this cozy log home with fantastic lake and moutain views. The layout is perfect for families, with a lovely master suite upstairs and finished lower level for the kids. Plus there are two more bedrooms on the main level. The location is extremely close to public beaches and excellent local dining. Newfound lake itself is beautiful. Great place to vacation! Thank you for the note. Everyone does remark on our incredible views for any season. And, the excellent local dining options have increased tremendously in the past couple of years. Many are open year-round now, too. After moving to NC from NH in 2008, we found Daly's Den on VRBO, and booked our first vacation here in August 2010. We have been returning every summer since usually for 1-2 weeks. This year we stayed for 2-1/2 weeks. From our first visit we fell in love with Daly's Den. This home is extremely comfortable and the views are mesmerizing. It is very easy to get lost while watching the sunsets over the lake... seeing the colors change in the sky and against the mountains and water... watching boats pulling water skiers while others lazily cruise Newfound Lake's interesting shores. We had perfect viewings of the Perseids' meteor showers from the deck on several occasions which from Daly's Den is breathtaking due to the lack of ambient night light. Inside the cabin are very comfortable furnishings to make you feel right at home. The large dining table is perfect for doing jigsaw puzzles or playing board games with friends and family. The home is well equipped including Wifi, TVs, etc. and provides plenty of room for 6 people to spread out. BTW, the master bedroom's king-sized bed is extremely comfortable! The surrounding Lakes Region and White Mountains area provide limitless things to do and see for both active and passive interests. Superb restaurants abound for all tastes and budgets. Janis and Jim Daly are excellent hosts and always responsive to any questions we have had. All in all, we have been extremely happy to vacation at Daly's Den and highly recommend it to anyone who loves a comfortable, relaxing setting with unsurpassed views!! We spent a quick two nights at Daly’s Den and loved every moment. The view from sunrise to sunset is just incredible and you don’t want to leave the house. The house is so warm and inviting. We were there on some of the hottest days and even though there is no air conditioning the fans cooled us really well and the finished basement with a cozy sectional and flat screen TV was at least 20 degrees cooler for a comfortable escape. We enjoyed hikes to Little Sugarloaf, Big Sugarloaf and Goose Pond and Profile falls. The Dalys were so accommodating and the house is fully stocked — We didn’t need to run out for any of the essentials. We can’t wait to return — hopefully for a longer next stay! Great to hear you had a good stay, even during the warmer weather. The basement room is a great spot to unwind, too. Thank you for the recommendations for area hikes. We hope you can book a return visit again soon. Great week celebrating our nieces wedding! View was beautiful as well as the weather!!!!! It started out REALLY hot.....was worried because there was no air conditioning.....then a storm came thru and changed that! The weather turned out to be perfect. House was nice. Had everything we needed. Great that it was pet friendly! Happy to hear you had a wonderful stay and the weather cooperated. We've had many guests comment on how amazing it is to watch the weather roll in over the mountains and lake. We had wonderful stay. The house had everything we were looking for and more. The view from the deck was spectacular allowing us to soak in the 180 degree sunrises and sunsets. We stayed in NH to attend our daughters PSU graduation and enjoyed some beautiful hikes and walks in the region (Welch, Dickey, Rattlesnake, Franconia Notch). We enjoyed relaxing back at the house for family dinners and game night. Private neighborhood association in Bristol, NH. 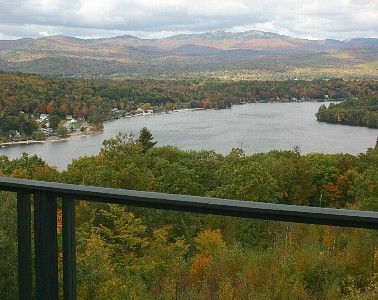 Overlooking Newfound Lake with easy access to town and state park beaches. Minutes to beaches, hiking, river rafting, caves. Skiing close by at Ragged, Waterville & Gunstock.